Woo hoo, another rug finished today – I’ve had to get a wiggle on to try to get enough pieces finished in time for the Saltaire Arts Trail. 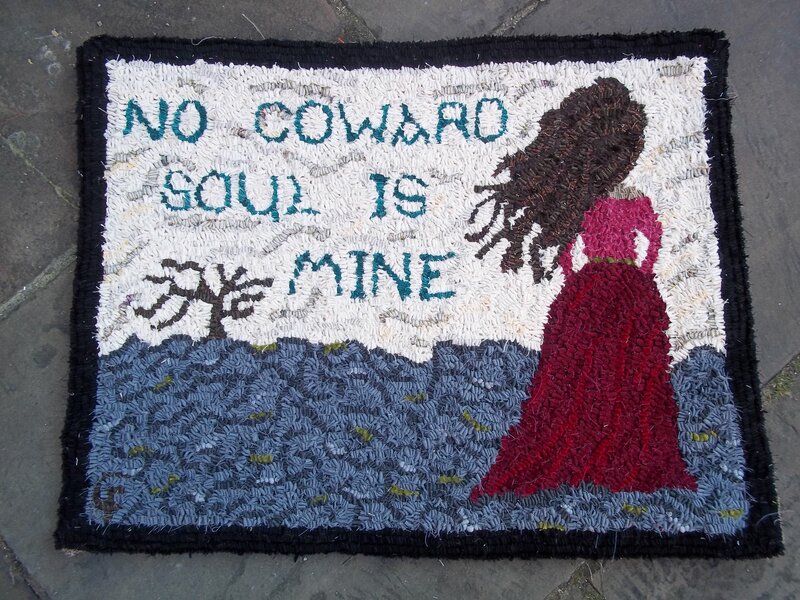 I had wanted to do a rug that included a figure, and I wanted to do something with a quote I love from an Emily Bronte poem, “No coward soul is mine”. 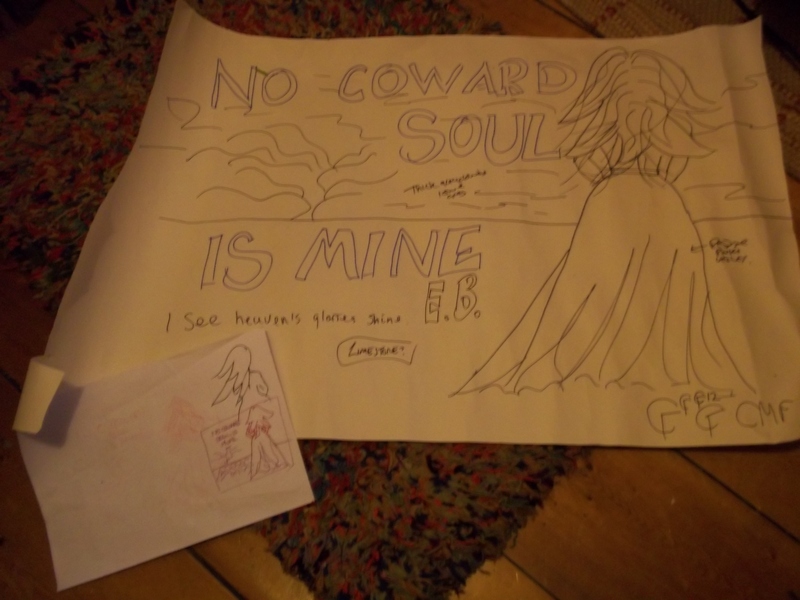 I did some quick sketches and eventually decided I kinda wanted her looking towards something, rather than us; I also wanted it to feature the hard limestone pavements we have around here, and the big low white and grey skies we get; something a bit harsh to contrast with the message – what ever it is she is facing, she will do so with courage. I sketched out the rug on wallpaper lining and knowing everything would work around the main figure I cut her out as a template and then using pins worked out where the border would be. I wanted a pretty thick border and found drawing it out in dashes rather than a continuous line was easier to follow when it came to hooking it. I worked one round of the border first of all and then started on the lettering. Once I had hooked one word and had got a feel for the scale, bits of wallpaper lining with the other words written on proved very useful in working out the spacing for the rest of it. I had to re-hook the first line as it was getting too close to the hair. I could have gotten away with it but I would never have been happy. Better to re-hook than regret! The letters are hooked in a green velvet and the hair in a variety of brown fabrics and I am really pleased with how it turned out although once the rug was near completion is became apparent it was too straggly and I filled in a few bits later on. I had imagined her in red – I wanted something strong yet feminine, and perhaps a little bit defiant. But by the time I hooked with the fabric I had chosen she just looked a bit too pink and girlie. I found myself experimenting with some patterned cotton. I actually really liked how this was working out but felt it was just getting drowned by the grey of the limestone, I also felt it was just too busy, I had envisaged this as being quite a blocky rug. After finishing the skirt in red I decided in the end to keep the pink bodice; it was toned down by the red and the brown, and the different colour perhaps added a little extra interest, and a whole dress in red threatened to perhaps be a little too much. I wanted the limestone pavement to be simple, and just two greys were used with a few tufts of light green. I had earlier put in some guide lines to get a sense of perspective which I see never really made it through! I always have problems with skies, I find it hard to get the right colours blues. I dyed some fabric specifically for this, and was really pleased with the colour, but just felt the texture of the cloth didn’t work, so out it came. I had just put a call out on Facebook for anyone who had any fabric to spare and someone very kindly gave me some cream heavy curtain cloth and I put that straight to use, with a couple of other bits and pieces to add little interest. I firstly hooked around the letters and the objects and filled it in. All then that was left to finish was the border. I still need to tidy up a couple of bits and do the backing, but it does what I wanted it to so, so I am pleased.